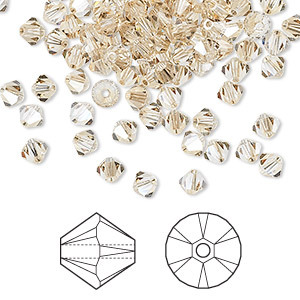 Bead, Swarovski® crystals, crystal golden shadow, 4mm Xilion bicone (5328). Sold per pkg of 1,440 (10 gross). Item Number: H20-4321CY Have a question about this item? Bead, Swarovski® crystals, crystal golden shadow, 4mm Xilion bicone (5328). Sold per pkg of 48. 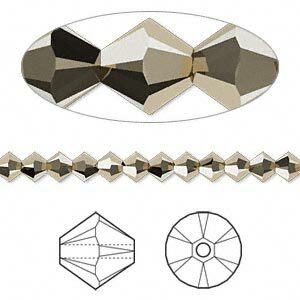 Bead, Swarovski® crystals, crystal golden shadow, 4mm Xilion bicone (5328). Sold per pkg of 144 (1 gross).